Find out about our latest products and projects on this page! Madison, Miss., June 11, 2010 - When Midwest transmission powerhouse American Transmission Company (ATC) needed to cross a protected wetland, New South Equipment Mats wasn't its first call - but it was their last. Thanks to help from New South's EarthSafe Wetlands Access division, ATC has been named one of the state of Wisconsin's "Business Friends of the Environment" for its eco-friendly transmission line upgrade in Bear Creek Marsh, Wisconsin. American Transmission Company provides electric transmission service to Michigan, Wisconsin and Illinois via 9,400 miles of high-voltage transmission lines and 510 substations. The Business Friend of the Environment Awards, given out by the Wisconsin Environmental Working Group (WEWG), honors companies committed to helping the environment through pollution prevention, environmental innovation and environmental stewardship. An independent panel of judges representing industry, an environmental group, the Department of Natural Resources, and academia select the Business Friend of the Environment winners. "As Wisconsin businesses strive to excel in tough economic times, these winning companies have proven that you can protect the environment and run a strong business," said Scott Manley, director of the Wisconsin Environmental Working Group. "These winners demonstrate that protecting the environment is the right thing to do, and less waste means more profit." "Our customer base often finds itself toe to toe with environmental activists and media reports, and the fact is many of these companies are working as hard as anyone to find ways to help protect our planet. This is a good day for us, but it is a great day for ATC and other companies who work hard to be environmentally responsible. Plus, the earth-friendly solutions New South devises can also be less expensive than traditional options," said Drew St. John, president of New South Equipment Mats, explaining that New South Equipment Mats specializes in innovative access solutions to challenging and environmentally sensitive projects. "We hope ATC's award is the first of many given to EarthSafe customers." For the project honored by this award, ATC faced a significant environmental challenge in upgrading a high-voltage power line through a large wetland near Stevens Point, Wisconsin - Bear Creek Marsh. ATC and Kenny Construction Company asked New South Equipment Mats to solve a problem previous vendors had been unable to overcome. "The traditional approach of using timber mats to support heavy machinery would have caused extensive environmental damage and been prohibitively expensive, assuming the traditional mats would have worked at all," said ATC environmental project manager Crystal Koles. "New South revolutionized the way we approached this wetland project." 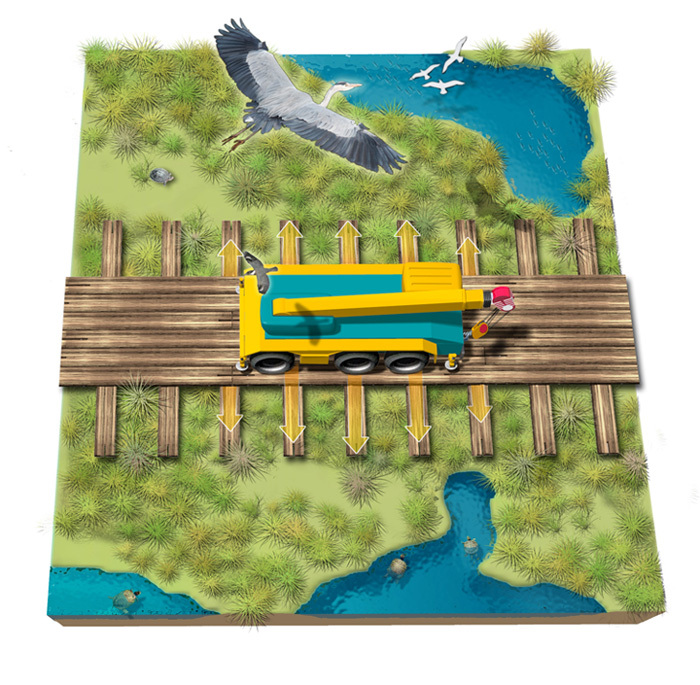 One tool of the EarthSafe Wetlands Access division is an innovative engineered wood laminate mat: emtektm. Emtek is twice as strong as (but half the weight of) traditional wood mats. Not only did this solution minimize environmental impact to the wetland, New South also saved ATC about $2 million in project costs. New South's proposed mat system had engineered certified load ratings that would meet the required 190,000-pound load-bearing capability to accommodate the heavy drill rigs, cranes and associated equipment. 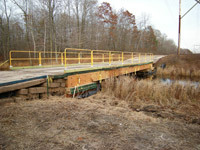 The over-water system included the placement of emtek support mats that exert minimal downward pressure and allow the main road deck to essentially float on the vegetative layer, rising and falling with the water levels. Once removed, the impact to the vegetation and soil was minimal, reducing any restoration costs and the amount of time ATC might spend on post-construction monitoring. ATC voluntarily went beyond regulatory requirements and found a cost-effective way to protect Bear Creek Marsh from typical access-related impacts. New South Equipment Mats is a next-generation provider of crane mats, work platforms, access roads and related services to top electrical T&D, pipeline and heavy construction clients. Established in 2006, New South was founded by professionals with more than 30 years of access experience to provide superior access products as well as services, from logistics and project design to mat lay down and pick up. With access to a strategically placed 20,000-mat inventory, New South Equipment Mats is uniquely poised to quickly solve any access need.